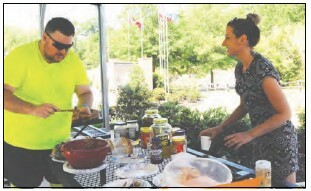 Bicyclist Richard Thomas, of Savannah, makes a peanut butter and jelly sandwich as B.R.A.G. representative Laura Shepherd asks about the ride. The Lifeway Pavilion on W. Marion Street was a rest stop for the hundreds of bicyclists. In addition to cold water and sports drinks, they could grab peanut butter and jelly sandwiches, orange wedges, bananas, cookies, trail mix, crackers, chips, pickles and olives to refuel their bodies from the long ride from Rutledge. 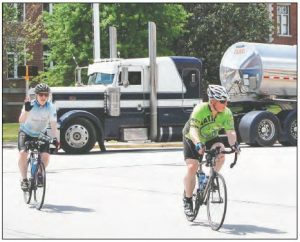 Hundreds of bicyclers rode through Eatonton throughout the day Friday, participating in the Bicycle Ride Across Georgia (B.R.A.G.) Spring Tune Up. 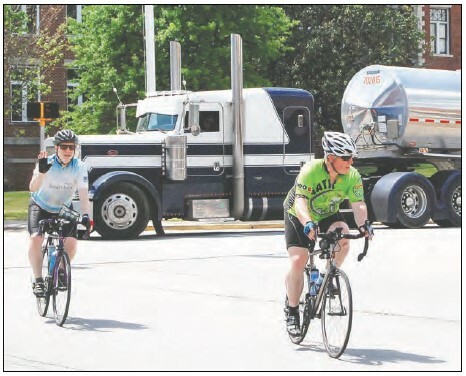 A number of bicyclists took their choice of 20- to 100-mile rides, beginning and ending each day in Rutledge April 21-23. 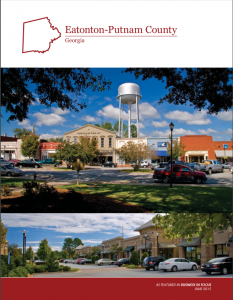 Friday’s route through Eatonton was a 69-mile ride. The Lifeway Pavilion beside the Veterans Wall of Honor in Eatonton was a rest stop for Friday’s route options. Two cyclists go through the intersection of North Jefferson and State Route 16/W. Marion Street Friday. Hundreds rode through Eatonton, sometimes in large groups, but usually in twos, on their self-paced ride.